Please note that the reciprocal link must be located on either your "Home" page, or a page accessible with ONLY 1 CLICK from your home page. Our system confirms all reciprocal links on a daily basis. If your reciprocal link is not found, your free listing will be removed. Reciprocal link code must be added exactly as shown below. Do not alter any of the link code. Be sure to indicate the location (URL) of the reciprocal link in the appropriate field on the registration form. Located below is the html code to create a reciprocal link to Sephra.com. Choose from several different links, depending on the layout of your website. One of these reciprocal links must be added to your website PRIOR to submitting a free listing in our chocolate fountain rental directory. Decide which of the reciprocal links below you would like to use. Highlight all of the necessary html code. Copy the code to your clipboard by pressing Ctrl + C or right click on the highlighted code and choose copy from your drop down menu. Once the reciprocal link is added to your website, you may submit a free listing to our chocolate fountain rental directory. Please be sure you include the location of the reciprocal link in the appropriate place on the registration form. Do this by navigating to the page on your website which contains our link and copy the entire URL into the field labeled: URL Of Reciprocal Link (Required For Free Listings). 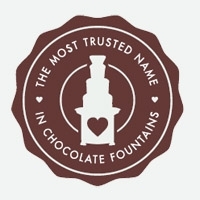 We use Sephra Chocolate Fountains for your special events.